The lineolated parakeet is one of the calmest and quietest members of the parrot family, making them ideal pets. Sometimes mistaken for budgies, lineolated parakeets are a bit stockier than budgies, and they are quieter birds. Unlike budgies, these birds enjoy walking about as much as they do flying, and they have a deep fondness for bathing. "Linnies" are also known for an odd resting posture, in which they rest in an almost horizontal alignment. The lineolated parakeet is also called the barred parakeet and the Catherine parakeet. Enthusiasts often know these birds by the nickname "Linnie." The taxonomical name for the lineolated parakeet is Bolborhynchus lineola. A variety of subspecies exist. Lineolated parakeets of various subspecies can be found in the wild in Mexico, Central America, and South America. The natural habitat includes dense forests in mountainous terrain, such as found in the Andes mountains of Peru. The lineolated parakeet is a small parrot species, typically reaching lengths of 6 to 7 inches when measured from the beak to the end of the tail feathers. They normally weigh less than two ounces at maturity. The average lineolated parakeet can be expected to live for up to 10 years in captivity, but there are many cases of these parakeets who have lived for up to 20 years. When properly cared for and hand fed as babies, lineolated parakeets develop very sweet and even-tempered personalities. They are extremely social birds by nature and they love to spend time with (and sitting on) their owners. Known to make comical little pets, the highly social lineolated parakeet makes a very entertaining family member, always eager to spend time playing with its human flock-mates. Anyone who is interested in adopting one of these birds should make sure that they have plenty of time to spend interacting with their new pet, as lineolated parakeets bore easily and need ample daily play time. These playful birds are quieter than most parakeets—they tend to chatter rather than screech. They can be very able talkers, enunciating clearly, though with a more limited vocabulary than other parrots. They are very good at mimicking sounds and whistles. Lineolated parakeets in the wild display mostly green feathers overlaid with black and dark green stripes on the backs, wings, and sides. The undersides of the wings are blue, and the tail feathers are dark green. They have horn-colored beaks and brown eyes. Captive-bred lineolated parakeets can display an array of color mutations—the feathers change color after leaving the wild—including blue, cobalt, turquoise, and white. Male and females are nearly identical, although careful observers males may notice that the black stripes are more numerous on males. This is a small bird that doesn't require a huge cage, although bigger is always better. For a single lineolated parakeet, the bare minimum is a 24-inch square cage, provided you are giving the bird ample outside-the-cage time each day. These birds also do quite well in aviary environments with other linnies or related small species, but be aware that small flocks may be a bit noisy. Although they are not notorious for damage, lineated parakeets, like all parrot species, will chew and gnaw, so provide your bird with plenty of acceptable chew toys and natural wood branches that will help him distinguish when chewing is acceptable. Your lineolated parakeet should be allowed out of his cage to interact with the family for several hours each day. These birds like to walk about on furniture and floors, and some owners report that the birds like to burrow under blankets and fabrics. Take care not to accidentally sit on your pet. Like other parrots, the lineolated parakeet can go through a difficult adolescent period where they attack and bite, but this soon passes and is generally not much of a problem, as the birds aren't large enough to do serious damage. This adolescent period soon passes and gives way to a very sweet pet. The toenails on a lineolated parakeet grow quite fast and will need regular trimming. A "grooming" perch can be useful here, since it helps keep the nails abraded. Bathing is a favorite activity of a linnie. They enjoy weekly or even daily showers with a spray bottle filled with luke-warm water. Make sure your bird can preen and dry off in a space that is not drafty. 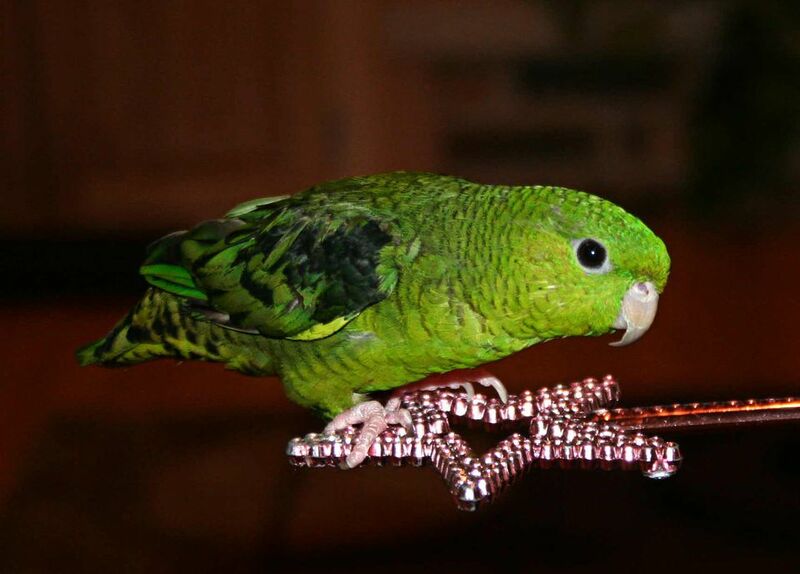 As with any hookbill species, it is important to make sure that captive lineolated parakeets are fed a proper diet of a high-quality seed and pellet mix, along with a variety of bird-safe fresh fruits and vegetables. This will most closely approximate the diet that the bird would feast on in the wild, leading to better nutritional fulfillment and reduced risk of health problems. Lineolated parakeets enjoy fresh sprouts, and should be provided with spray millet. Offer calcium in the form of cuttlebone or a mineral block. Lineolated parakeets are very active birds who spend a lot of energy in the wild playing and interacting with their flock-mates, foraging for food, and making sure that they aren't being targeted by predators. In general, a lineolated parakeet needs three to four hours of out-of-cage playtime per day to get a proper amount of exercise. Potential owners should make sure that they can supervise their birds in a safe, bird-proofed area during these play sessions. Lineolated parakeets and budgies are susceptible to some of the same diseases as other parrot species, and these are often fatal in such small birds where treatment is difficult. However, many other problems with small parrots such as linnies and budgies are traced to vitamin deficiencies, which can be treated and prevented by making sure the diet is varied and includes fresh fruit and vegetables, not just seeds. Parakeets are especially prone to fatty tumors, and many experts recommend feeding these small birds sprouted seeds as a preventive measure.